AHMAD ZAHID: I am confirming that the donation was from the Middle East because I saw the documents. 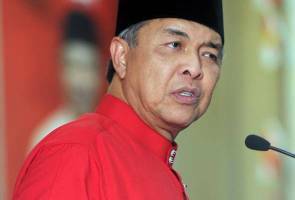 BATU PAHAT: Malaysia's commitment in fighting terrorism, upholding the teachings of the Sunni school of thought and moderation are the reasons why a Middle Eastern donor contributed RM2.6 billion, said UMNO vice-president Datuk Seri Dr Ahmad Zahid Hamidi. He said the donor appreciated Malaysia for its seriousness in fighting terrorism. "I am confirming that the donation was from the Middle East because I saw the documents and met with the chief investment officer of the donor and financial trustee of the family of the donor. I asked why USD700 million was donated to Malaysia. "I asked why provide assistance to UMNO and Barisan Nasional (BN). He gave three reasons - the first because Malaysia is fully committed to anti-terrorism and Malaysia had the Prevention of Terrorism Act (POTA), the Penal Code, the Security Offences (Special Measures) Act 2012, as we do not want terrorists to disrupt (the nation)," he said. Ahmad Zahid who is also Deputy Prime Minister was speaking at the opening of the UMNO Sri Gading division delegates' meeting here today. Also present were Sri Gading UMNO division head Datuk Ab Aziz Kaprawi, Johor UMNO information chief Datuk Samsulbari Jamali and Johor Wanita UMNO head Datuk Sharifah Azizah Syed Zain. Ahmad Zahid said the second reason for the donation was because Malaysia followed Sunni teachings and the donor did not want there to be other sects which deviated from the teachings of Prophet Muhammad. He added that the third reason was the clear commitment by Malaysia which has a plural society to the path of moderation, which was acknowledged by other Islamic nations. "I saw the original documents, not photostated (copies). I also saw the financial transactions," he said. Ahmad Zahid said the transactions went through several channels and companies as the donor did not want only one cheque to be deposited into one account under Datuk Seri Najib Razak's name to be used as political funds. "If this is disputed, then how about the political funds of the DAP, PKR and PAS. That is why the Prime Minister (PM) challenged their leaders, if they disclose the sources of their funds, the PM will also be willing to disclose where the funds came from," he said. Ahmad Zahid said to date, the challenge had not been taken up because the opposition was scared to reveal the sources of their political funds. He added that he was revealing this to prevent confusion over the funds and to avoid slander especially that being spread on social media and by the western media. He said slander seemed to be common fare since the days of previous Prime Ministers and had become more rampant through the Internet during Najib's time. He said the explanation was to clarify and show that there was no embezzlement of the Pensions Trust Fund (KWAP) but the money was a donation from a Middle-Eastern family. "If we are slandered, how would we feel? That is why Tan Sri Abu Kassim (Malaysian Anti-Corruption Commission) was sent to meet with the donor and confirmed that there was no corruption but the funds were 100 percent donated by a family in the Middle East," he added.